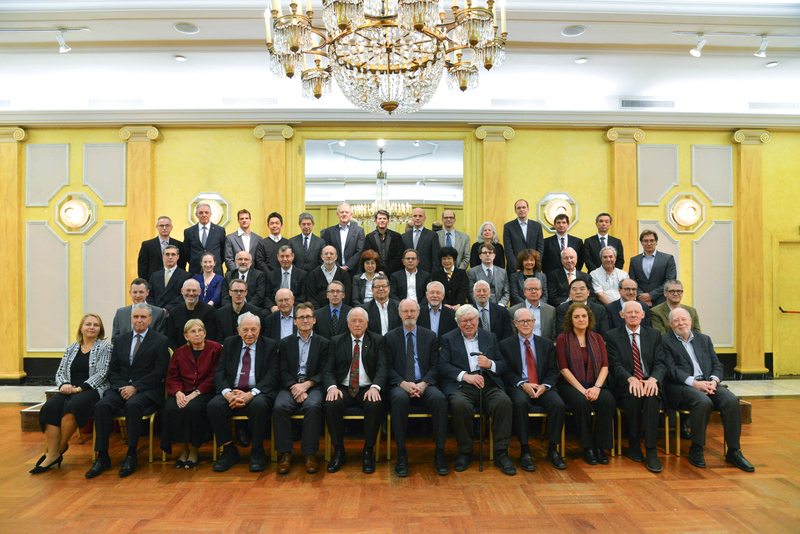 Last month Professor David Lilley from the School of Life Sciences was selected to chair a session at the prestigious Solvay Conference in Brussels. The Solvay Conferences began in 1911 and take place every three years in physics or chemistry. The event is invitation-only and attended by around 50 scientists who are the world leaders in the area of the meeting. The 1911 Solvay Conference in Physics was the first international conference in physics ever to be organised. Attendees over the years have included the likes of Einstein, Marie Curie, Planck and all the founders of quantum mechanics (one of the two main pillars of modern physics). This year's meeting was on Catalysis in Chemistry and Biology, and organised by Kurt Wüthrich and Robert Grubbs. Both are Nobel prizewinners, making a total of five Nobelists at the meeting altogether. The conference comprised four sessions on chemical catalysis and two on biological catalysis. The session Professor Lilley chaired was the final one, on RNA Catalysis (a subject of fundamental importance, touching on the origins of life on the planet). Each participant in the session presented a short talk (the chair for 20 minutes, the others of 10 minutes) followed by lengthy discussions between session participants and then more widely. At Solvay Conferences the main focus is on discussion rather than presentation, with the aim of achieving a consensus view amongst the leaders in the area. The first session was attended by His Majesty The King of the Belgians, with members of the Solvay family attending throughout the conference. The meeting included an evening reception at the Hotel de Ville in Brussels, and another at the Solvay family home. "It is clearly a great honour to be invited to a Solvay conference, where only the world leaders in the subject are invited to speak and discuss their science. This conference has such a phenomenal history, beginning with the amazing physics conferences in the early 20th century. It is hard not to overawed, walking in the footsteps of such legends of science as Albert Einstein and Marie Curie," said Professor Lilley.